You settle down to watch a video, and a pre-roll ad begins to play. The five seconds until you can ‘click to skip’ seem like an eternity. You feel irritated, resigned and bored. For a generation brought up on VOD and the internet, the concept of imposed video ads is simply intolerable. These days, people are not watching just one screen. During commercial breaks, the vast majority of viewers turn to their mobile phones for relief. According to a study by Deloitte for YouGov, fully 86% of people skip TV advertising on their DVRs. Yet, even so, video is going strong. Over 500 million hours of video is watched on YouTube every day. The popularity of video on Instagram and Facebook stories, and the new Instagram TV, all prove that video is still the preferred medium. The difference is intent: if the viewer wants to watch the video, that’s great. But if they don’t, then forcibly showing your pre-roll or medium-roll ad will mean it is ignored (at best), or irritates the viewer (at worst), which can cause damage to your brand. There’s a new video platform that takes native outstream to the next level. It’s Outbrain FOCUS, and it is a ‘Click-to-Watch’ format – the exact opposite of click-to-skip. Click-to-Watch ensures the viewer’s high intent and engagement from the outset. How? The video does not automatically begin playing, nor is it pre-roll, which forces the viewer to sit through the video until they can click to skip it. Rather, the viewer must actively click in order to watch. When they click, the video player pops out from the web page, giving an immersive viewing experience that – most importantly! – the user has chosen. They are leaning into the video, primed for high engagement and completion. #6 Don’t be afraid of long-form video. Given that today’s audiences want to get ads over with as fast as possible, there’s a common misconception that short videos work better than long ones. This stems from the way that video engagement is measured. If your video is very short, then it is more likely to get a higher completion rate. But that doesn’t mean that your audience is engaging meaningfully with your content. It just means they couldn’t hit the ‘skip’ button fast enough. On the contrary, today’s viewers want more than just ads. They want video content that excites, challenges and entertains. As long as your content is relevant and engaging, the longer video actually tends to perform better in our testing. Longer-form video gives you space and opportunity to create a deeper brand story and more value for the viewer – which is the key to true engagement. Check out this example of a longer-form Click-to-Watch video by GSK promoting their Sensodyne toothpaste brand for sensitive teeth. GSK created an exciting and instructive 60-second film about Yakutsk, “the coldest city in the world”, and how their residents cope with sensitive teeth in extreme weather conditions. The results were amazing: 49% completion rate, with an average viewing time of 37 seconds. It may seem that headlines belong to traditional text ads, but they are extremely important for native outstream and Click-to-Watch video too. First, the headline provides important information that the viewer can easily digest, even if they only watch a few seconds of video. For example, if your video is promoting a special offer, write it in the headline. Even if the audience doesn’t finish watching the entire video, they will still absorb the main message. Second, the headline provides valuable context. It helps to set clear expectations of what the viewer will gain by watching the video. In fact, a Hubspot study shows that headlines which include a clarifying explanation, such as [New Report] or [Review], performed 38% better than headlines without. When people look at websites, they scan for keywords and headlines that grab their attention. This is true of video too. When creating a headline for your video ad, make sure to use keywords that entice your target audience. #4 Go strong on branding. 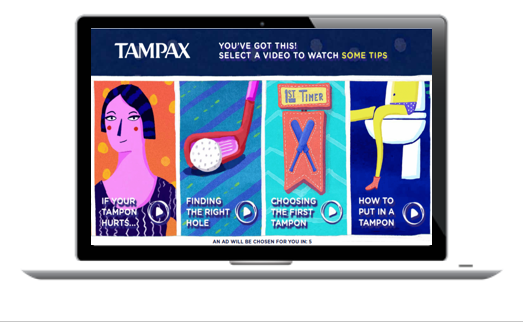 Although native ads employ a ‘soft-sell’ approach, they have been shown to create a brand lift of 82%! While you should never push your brand on the audience, you can subtly and successfully inject branding elements in your native ads. Outbrain partners with Innovid to provide advanced ways to brand your native videos. For example, the area around the video player is the perfect space to display your logo and brand colors. You can also include a static CTA that is visible throughout the entire viewing experience. 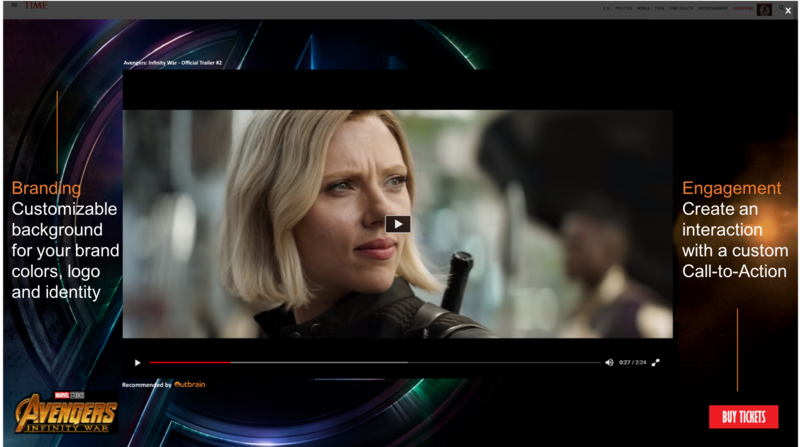 Take a look at this example of a Click-to-Watch ad developed by Innovid for Marvel, promoting the new Avengers film on the Outbrain network. It is complete with a branded border and built-in CTA button to buy tickets to movie screenings. Sixty-six percent of content marketers say that interactive content performs better. Although video is already more interactive than static text, there are ways you can make your videos even more exciting and engaging. 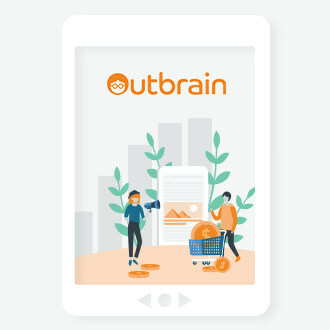 Outbrain’s FOCUS platform provides a range of interactive elements built in to the video experience. This includes a real-time adaptation of location or weather data, based on the user profile. For example, see this Chrysler car ad – depending on the zip code entered by the viewer, the price and sale information in the video varies. Great video content and effective targeting go hand in hand. One without the other simply won’t get you results. Outbrain offers a range of in-built targeting tools that you can incorporate in your FOCUS video campaigns. You can find new audiences similar to your current audience with the Lookalikes solution. Geo-targeting, interest targeting and remarketing can all be very powerful tools if used in the right way. Proper audience targeting starts with first knowing your audience. Then, you can find them with the help of Amplify targeting tools. For example, if you are running a campaign for a line of dog toys, you can check with your Amplify account manager at Outbrain to discuss the best targeting options for dog owners. The same is true for just about any vertical or product – your best audience is waiting to be found! #1 A/B test your videos too! Although Click-to-Watch is the most advanced and powerful way to promote video online, don’t forget to begin with the basics. Things like the size and placement of your CTA, your video headline, and the message of the video itself, are all critical to the success of your campaign. The way to determine what works and what doesn’t is with good-old AB testing. AB testing enables you to run two simultaneous campaigns with slight differences – such as different headlines, font color, or CTA message – so you can get real time data about which ad performs best. Then you can optimize the ad, rerun it, and do further A/B testing to get even better results on the next round. By 2020, it is estimated there will be over 230 million viewers of digital videos in the US alone. The one thing they all have in common is this: limited attention span, and advertisers who are fiercely competing for it. As advertisers, the last thing we want to do with our video ads is frustrate or annoy potential viewers. You can create enjoyable and valuable native video experiences by producing great video content, serving it to a precise targeted audience, and giving viewers the opportunity to lean in with the new Click-to-Watch approach. There’s no point in forcing anyone to watch. 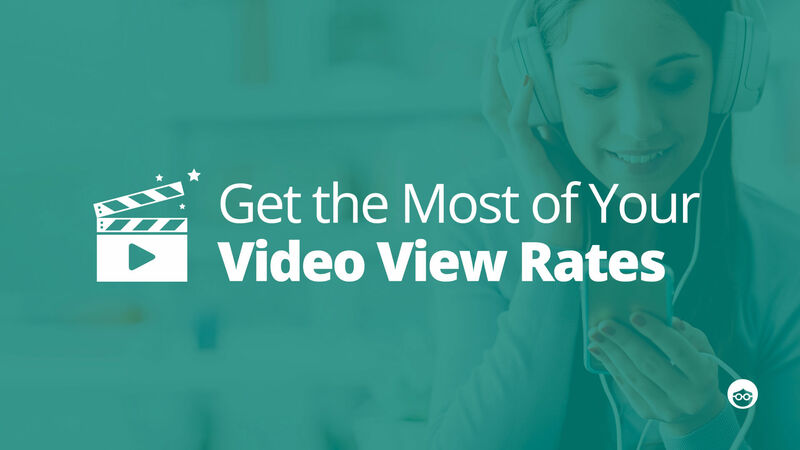 If the user wants to see your video, they will get so much more out of it – and so will you! Melodie is Video AdOperations Manager at Outbrain. Born & raised Parisian living in Tel Aviv with her husband & two old pugs. Enjoy cooking, watching the Simpsons & Family Guy and her next life goal is to (finally) get a driver's license.